161 in stock Need More ? 22 x 27 cm  p. : chiefly col. ill. Reprint. Originally published: London: Julia MacRae, 1989. 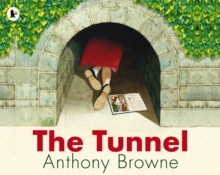 Anthony Browne is at his most brilliant in a new edition of this profound picture book about sibling relations. Once upon a time there lived a brother and sister who were complete opposites and constantly fought and argued. One day they discovered the tunnel. The boy goes through it at once, dismissing his sister's fears. When he doesn't return his sister has to pluck up the courage to go through the tunnel too.